It was to force some dream of youth, experience the Eagles concert. A band that played on Monday to break three hours, and filled it in abundance. Eagles first spoke in the Czech Republic and offer fans an unforgettable experience perfect decorated. Folkrock archaic sound, which is zhoupnul and the country, built by Eagles in the seventies is also a musical past. However, the band presented him with a taste and freshness, that man must have given the right sentence, repeating: music is just good and bad, do not have time to play a role. It however acknowledged that in the Czech Republic, which had not yet, Eagles are not so large as posluchačské base metal legends or Queen. Prague O2 Arena was full to about half the crowd was focused in the area under the stage. But when was the allowances, the audience tried to conceal their numerical weakness. Sometimes dorovnávalo this handicap tleskáním and dupáním. Have been gratifying and practical habits Eagles. The band began as were on the ticket, then in twenty hours, and gave the man a feeling that came to social events. Four Eagles, veterans Glenn Frey, Don Henley, Joe Walsh and Timothy B. Schmit, the nine accompanying musicians opposed conservative suits or white shirts and tie - to when the jackets off. The backs have a projection screen in the shape of půloblouku that image while decently illustrated songs. Megahit Hotel California, after which posluchačka behind me said, "And now we can go home," who heard after the initial run, illustrated look at the palm trees and California belfry. In krevnaté track Funk 49 begin running funny animation projection in the spirit of beatlesovské yellow submarine. Waiting In The Weed, song of the last dvojdesky Long Road Out Of Eden, accompanied the footage on undulant grain, dusty paths and old cars. Naive, hot, lazy atmosphere of creeping California summer obviously shone iz Eagles music. Words of perfection, even přecizelovaná, can be described as all thirty songs concert Monday. Eagles, who in the Czech Republic be inspired Zlínský AG Flek, discography are concentrated in the seventies. Then at fourteen years broke up, remind the plate Hell Freezes Over, and after years osmadvaceti published a collection of brand new tracks on dvojalbu Long Road Out Of Eden (2007). Who knows, if we were witnessing the last Eagles tour, which concentrated all the effects, and a perfection in music. Followed by a trip to the seventies when the band reached the Peaceful Easy Feeling the debut album, which was easygoing country rock, actually almost Lidovky, embellished - of course - vibrant polyphonic. For smooth, velvety melodies I Can not Tell You Why, already sang mainly Timothy B. Schmit, the vocal music přehoupla to fluffy song Witch Woman. Lyin 'Eyes was countryovka with violin and lidovkově "poskakujícím" piano, song The Boys Of Summer raised rockovější sound with delicious singing guitar including precizního, sharper frázovaného singing. To break the Eagles play in the city, the song of 1979 in which the music closer to chaos and the city that showed the possibility of supporting other groups. The game is fully involved and čtyřhlavá brass section. News No More Walks In The Woods started the Eagles, sitting in a straight line at high stoličkách as vocal exhibition. A continued its stylish tuned excursions, to be rock měkkému No More Cloudy Days, illustrated projections of clouds, or the gentle ballad Love Will Keep Us Alive. One of the concert was song Take It To The Limit of 1975: polyphonic zařezávaly the faster pace and sharp as a knife was next to the beauty and precision rytmičnost excel. A dramatic composition demonstrated a band in Long Road Out Of Eden, the song that reminded old, punks hated artrocku era. With the impending conclusion of the concert as the band only odkrývala full capacity. 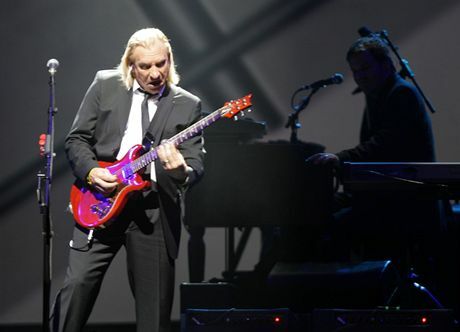 In the song walk away with, thanks to animal guitarist Joe Walsh, rozbouřila metal music. One Of These Nights offered beegeesovsky thin vocals zneklidňované "prancer" guitar, and Dirty Laundry, it was just kick, which is the Funk 49 zklidnil in roztleskávačce Heartache Tonight. After vytleskaných allowances in the period came ballad Desperado - how else, with icing eaglovských vocals. Who knows, if we were witnessing the last Eagles tour, which concentrated all the effects, and a perfection in music. Pinch or fatigue symptoms by the age of image veteránských Orlů zbortily. Something like that certainly not the band. Maybe because after they left the impression as if they sang the last. 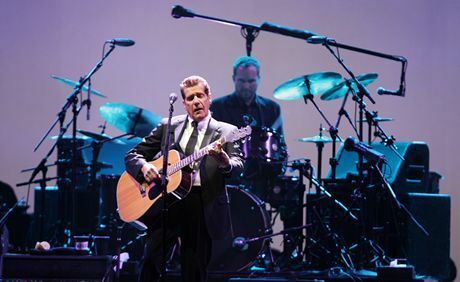 PRAGUE - The American country-rock group Eagles today for the first time in his long career appeared in the Czech Republic. The audience, which is estimated to organizers gathered almost 8000, heard the older songs and new bands, which before last after 28 years, has released a new album. The first voiced country song How Long, which comes from the new plates and sung by Glenn Frey and Don Henley. 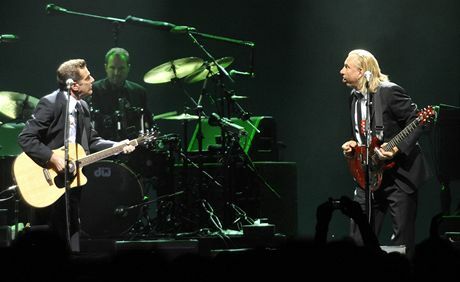 Eagles, the addition of other musicians, dress in dark suits with a narrow tie, from the first songs to take audiences harmonic vocals and catchy melodies. In the song I Do Not Want To Hear Anymore as soon introduced the singer bass player Timothy B. Schmit. "Good evening, Prague. We are the Eagles. And you play the older pieces and new things from our plate Long Road Out of Eden," welcomed the audience with guitarist and singer Frey. Text famous Eagles song Hotel California, voiced as the fourth, the hall sang with the band. The composition of the perfect hotel from which, however, not to leave, occurred on the same board in 1976, three months after the issue was for the sale valued platinum and briefly to the Grammy. Title song is still popular, this year received more platinum in a million download on the Internet. People applauded and guitar solute in this song, which appears on selecting the best sól of all time. "They are frajeri. I'd like to see another band, which would give troufla its largest stone like that at the beginning of the concert," observed one of the spectators. In the first part of the concert have been 11 songs - the older hits such as Peaceful Easy Feeling, The Long Run Lyin'Eyes or even songs from the new album. "I will be a short break and then play even more songs," then told Frey. After the break the group, already vysvlečena of jackets, continued rotation of the plate track Long Road Out of Eden, which now, once jumped on top of the ladder of merchantability, and of years of hits. The band more than in the first part used a projection screen behind its back, for example, the new albums title track accompanied efektními shots of the desert. As in the first half performance, in the second, much longer, Eagles turn zvonivé country tunes with strong rock rify. In addition, you vytleskalo satisfied the audience, and have been huge hits Take It Easy and Desperado.